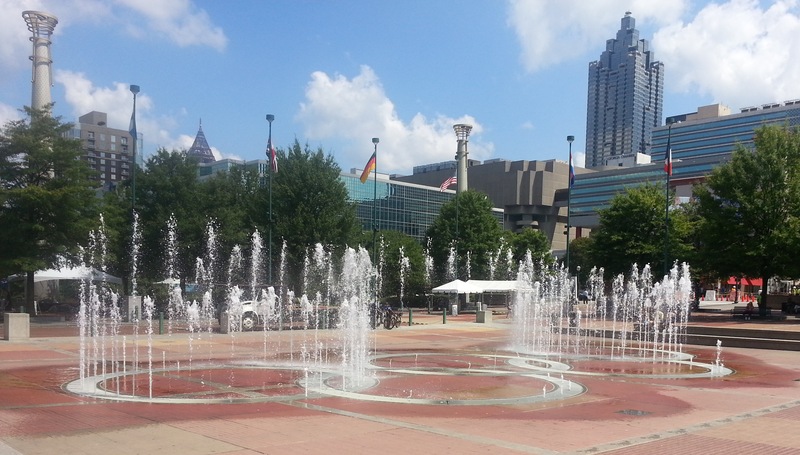 So there we were, Josh Gibbs and I, enjoying our lunch break on a lovely sunny day at Centennial Olympic Park. As an Atlanta native, I was living here when the olympics came through town and have a brick in the park. We took a little stroll to visit it and then settled down by the fountain to enjoy the Fountain of Rings show that happened to be scheduled at that time. As we sat there absorbing the novel touristy experience, trying to identify the musical strains that blared from the speakers, we started to analyze it. We couldn’t help ourselves. That instinct to see beyond the surface, to reverse engineer the system through a verbal exchange, was too powerful for us to just be in the moment. This is why we can’t have nice things. However, as we gazed upon these new and shifting patterns of water jets set to music, we noticed a flaw in the system. One water jet was misbehaving. At first, it seemed like some sort of counterpoint to the carefully orchestrated flow, perhaps a harmony in the song that I couldn’t properly detect. As the songs changed and that jet continued to spray, it became clear that it was out of turn. So we started looking for rules we could test to explain the behavior systematically. We speculated that the jet was always on, but when the song ended the water completely died away. We proposed that this little jet was always spraying water, always turned on but only as long as any water was emerging from the fountain. When some jets were performing but the jets around it were not active, this jet bubbled closer to the ground, but as the jets around it reached for the sky the broken jet struggled and failed to follow suit. So that rule seemed to hold. We considered the historical context of this fountain. Constructed for the 1996 olympics, the initial design had to be created with technology available at that time. So what kind of controls were determining where the water flowed, how long the water flowed (to produce the varying effects from a water ball to a towering jet), how hard the pressure was (to provide a jet of a particular height), how quickly the pattern could change, and so on? Had the original system been maintained all this time? How would you upgrade a system like that? Was there a fixed playlist with predetermined songs and water choreography or could someone provide new inputs? If you could submit a new sequence, was it possible to hack the fountain? And if so, what was the risk involved (likelihood, impact)? I think we left with more questions than we answered, but it was still a fruitful conversation. It was a nice little trip down memory lane and forced me to confront the reality that testing is a way of life, a path that I am always on.